The Global Center continues to support Ethiopia in countering money laundering and illicit financial flows as part of a 24-month capacity building program supported by the government of Denmark. The program is implemented in partnership with the Ethiopian Financial Intelligence Center (EFIC), the Federal Attorney General’s Office (AG, formerly the Ministry of Justice), and other key stakeholders. During the first half of 2017, the program has focused on supporting expanded engagement with regulatory and investigative authorities, drafting of guidance related to enhanced due diligence for high-risk jurisdictions and proliferation financing sanctions, and conducting a desk-based assessment of international best practices and legal frameworks related to the establishment of an asset management bureau for frozen or confiscated assets. To support this work, five trainings were implemented for a total of 109 representatives from the private sector, government agencies, and regulatory bodies. These trainings provide a mix of policy, practice, and case studies to strengthen individual and institutional capacities on key areas related to anti-money laundering and countering the financing of terrorism (AML/CFT). One of the key issues identified by the Financial Action Task Force (FATF) is Ethiopia’s lack of a legal framework on sanctions related to the financing of proliferation of weapons of mass destruction (WMDs). The workshop provided international examples and practical guidance on the development of such frameworks in Ethiopia, with the second day of the workshop engaging working groups to develop and receive feedback on a proposed outline for proliferation financing regulations. In line with FATF Recommendation 34, a training was held on the main components and objectives of guidance notes with a focus on integrating the risk-based approach for cash-intensive businesses. The training provided international examples and good practices and is intended to set the stage for subsequent workshops and drafting exercises by theEFIC. In order to advance dual-compliance mandates in Ethiopia, a workshop was held with regulatory bodies on AML/CFT supervision. 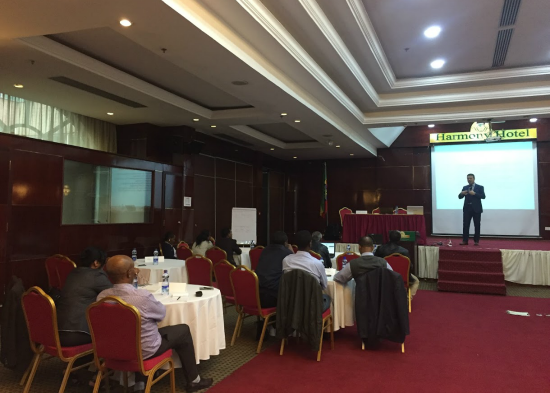 The training focused on Ethiopian AML/CFT legal frameworks, sector-specific risks for money laundering and terrorist financing, and the risk-based approach to AML/CFT supervision. The training built upon earlier AML/CFT awareness raising sessions conducted with regulators and reporting entities under this program. Expanding upon the a prior certification program on financial crimes, a second training course on financial crimes has been implemented for prosecutors from the Criminal Directorate in the Attorney General’s Office and lecturers and practitioners from the Ethiopian Police University College (EPUC). The first training focused on understanding money laundering and financial flows, including the money laundering cycle, typologies and trends in Ethiopia, and sources of information for financial investigations. This workshop was convened to provide direct and targeted technical assistance to a small committee of local stakeholders on key priorities including enhanced due diligence, development of regulations related to high-risk jurisdictions, and the risk-based approach to supervision. The training provided an opportunity for participants to ask questions of local and international experts, and to discuss how international approaches and good practices could be incorporated in Ethiopia. Updates from the first year of the program can be found here (January-June 2016) and here (July-December 2016). For more information, please contact Ms. Tracey Durner at tdurner@globalcenter.org.